The Bulgarian Hetzer that I started back in May is almost done. 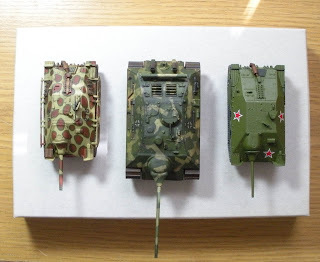 I bought some 1/300 Soviet aircraft decals for the stars on the Hetzer, but they turned out to be too small. 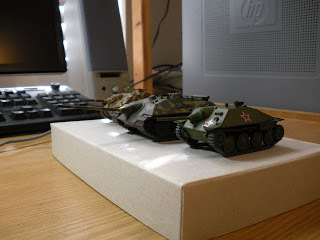 What I had to do was use some Archer U.S. stars, and then Soviet armor decals from a PST kit on top to get the red star with white outline for this model. I still need to spray with a flat coat, and weather, but this kit is 90% done. 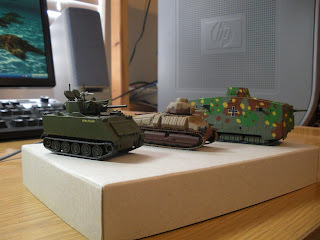 I have posed the UM Hetzer alongside the Pegasus E-25 and the Fujimi Hetzer. The E-25 is huge compared to its smaller cousins. For the FSV I started last month, I used Archer Fine Transfers to make the name (Bewitched), and I'll add some Milicast crewmembers. I'm still trying to find some black triangle decals or transfers though. 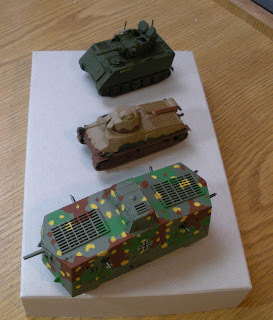 Next to the FSV is the Heller Somua S-35, which is in the process of being painted, and last in line is the Emhar A7V. I started the A7V about four years ago, and am finally 90% done with it. I only need to spray with a flat coat, and weather. I'm looking forward to do at least two more A7Vs, but will definitely work much faster on them this time. Another view of the FSV, S-35, and A7V.